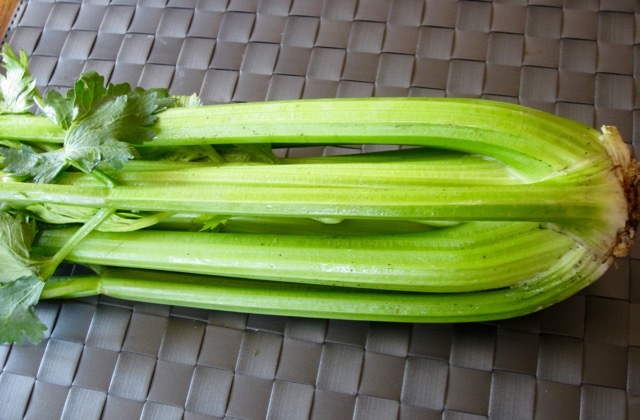 Also known as: Stem or stalk celery, Sweet Celery, cultivated celery or simply celery, Céleri (French), Sellerie, Eppich (German) or Sedano (Italian). Celery is a cultivated biennial plant with thick succulent leaf stalks that are eaten raw or cooked as a vegetable. Celery is a popular herb and vegetable mainly grown for its thick succulent leaf stalks (petioles), leaves and seeds. The seeds are technically, a fruit called a schizocarp. All the plant parts are strongly aromatic. Celery takes just about eleven weeks from planting to mature into a crop ready for harvest. It is valued for it’s crisp texture and distinctive flavour. The stalks are naturally crisp due to rigidity of the plant cell walls and high water content within the cells. They can either be green or white. 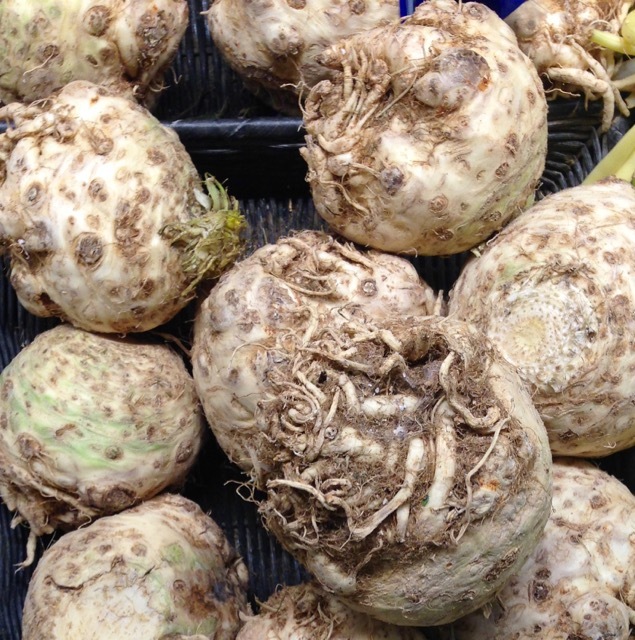 The variety celeriac is grown for its edible tuber. The most common commercially grown variety is the green celery, “Pascal”, also called French heirloom celery. It has long green firm stalks and ranges in colour from light to dark green. Several varieties of the green celery have been developed. The celery grown in winter (frost-hardy celery), has white stalks due to“earthing up”, or being covered in soil. This protects it from frost. White celery is only available in the winter growing season from September to March. It is less aromatic with a milder taste and is less popular than the green variety. In general the harder outer stalks should be removed and used for soups and stocks, and the more tender inner stalks are best eaten raw in salads or as appetizer. Celery is available all the year round. Celery hearts: this is the tender, innermost stalks or ribs of celery. Most of the so called celery hearts sold in the supermarket are actually just small stalks of celery that have been washed and trimmed. Celery has a very high water content (about 95%) so is exceptionally low in calories. It’s the best snack for weight watchers. 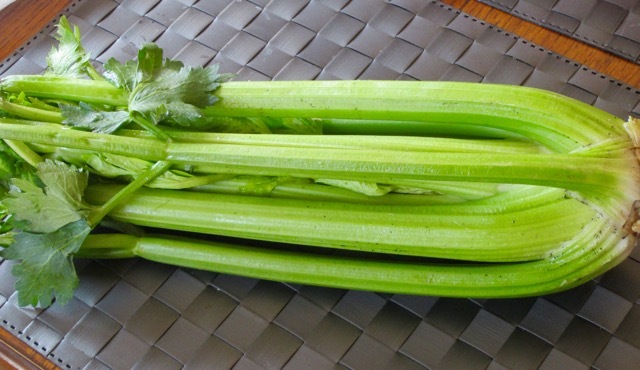 Per 100g (3.5oz): 12 calories, water 95g; sugar 1.4g, dietary fibre 1.83g; Fat 0.17g; Protein 0.69g and 28% RDA of vitamin K.
You can use celery stalks as an appetizer before having your meal. The stalks can be eaten on their own or together with a dip. If you are watching your weight you can snack on celery which is a healthy alternative to oily potato chips or cakes or biscuits. Celery can be added to numerous salads together with cucumber, arugula and apples. The combination for salads is endless. I leave it to your imagination. To cook celery you can blanch, boil, sauté, steam, roast, stir-fry or microwave. You can also use celery stalks as a flavouring in soups, stews, and pot roasts. Use fresh or dried celery leaves to garnish soups or salads. You can also cook them in soups, sauces or stock; or in braised dishes, stews and pot roasts to enhance flavour. Canned celery hearts and slices, are used as a garnish. Celery seeds are the minute seed-like fruits of the celery plant which are harvested, dried and used as a condiment or spice. The so called seeds are technically, a fruit called a schizocarp. 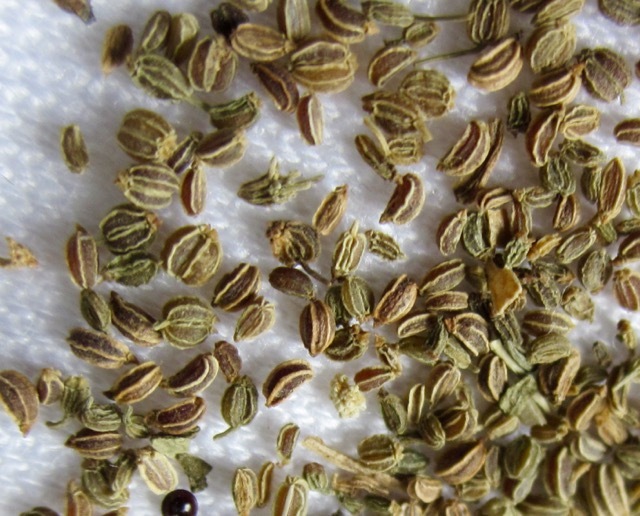 They closely resemble the seeds of Ajwain (Carom Seeds) that are also used as a spice but have a much stronger flavour and aroma. Celery is about 95% water so it should be kept away from the coldest parts of the fridge because it freezes easily. Freezing damages the cell walls and causes them to collapse. When thawed after freezing, the stalks will be limp and watery, and unpleasant to eat. Celery should be stored, wrapped, otherwise sprinkle with water to prevent wilting. Store in plastic bags in the crisper for up to two weeks. Celery can also be kept fresh for several days if the base of the stalks are stood in cold salted water. The light green celery stalks with glossy surface tend to taste best. The dark green stalks have more nutrients but tend to be stringy. When shopping, look for firm and compact bunches with crisp stalks, free of bruises and cracks. The stalks should snap when broken in half. The stalks should be well shaped, and the leaves should be green and fresh looking. Availability: all the year round. Var. graveolens. representing the wild type of celery. Var. secalinum (Alef.) Mansf. known as the leaf celery, because it is cultivated for the aromatic leaves. It has slender green petioles, and is closest to the wild type. Var. dulce (Mill.) Pers. the stalk celery, grown for its thickened succulent leaves which are curved in cross-section and grooved on the external surface, with a distinct joint where the leaflets are attached. Want to Read More About Celery? Good post Liz. Very informative.